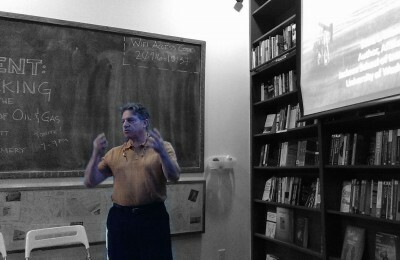 The complexity and density of Scott Montgomery’s presentation, Fracking and the New Era of Oil and Gas, appropriately reflected the same nature of his topic. The conversation concerning energy resources and dependency in the U.S. is thick with controversy and best listened to or engaged with when one is informed by the equally thick and extensive history of the global industry. Despite looking at only a specific section of U.S. energy, and condensing decades-worth of compiled research and data into a two hour presentation, the amount of information Scott presented was extensive and this post just scratches the surface. Even still, Scott’s presentation was accessible and enjoyable to all those in attendance, ranging from people in the industry to those of us who went in knowing next to nothing. Scott Montgomery is a prolific writer, lecturer, teacher and scholar whose work has focused on science communication and energy, but expands to the humanities as well. He started his talk by citing his aim to give an unbiased presentation. Turned off by the politics of the industry in 2007, Scott turned his focus to research and education. From there, Scott emphasized the complexity of not just energy, science, or knowledge itself, but the planet as well. “The world is a very complex place.” An important take-away, for fracking is something from which one cannot strip the foliage, no matter how often popular media attempts to reduce the practice down to a few boiler-plate statements. Scott outlined the history leading to the current boom in Natural Gas in the U.S. Following the 1970’s peak oil production, the Department of Energy started funding research surrounding alternative methods of extraction, up until the Reagan era during which all funding was cut. There was a resurgence, however, in the late 1990s that led to new methods of drilling, including horizontal mixed with vertical drilling and computer guided drilling which permitted more precise targeting at greater depths. All of these innovations meant that there could be more drilling done in a shorter amount of time, with lower impact and greater production. Because fracking is a very involved, industrial project, any increase in efficiency is welcome. A horizontal well next to a vertical well. The process of fracking itself is relatively straightforward. 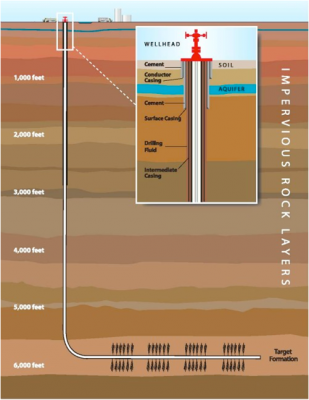 The well is drilled approximately 6,000 ft. into the ground, with casings in place to provide protection to the well and the area surrounding. 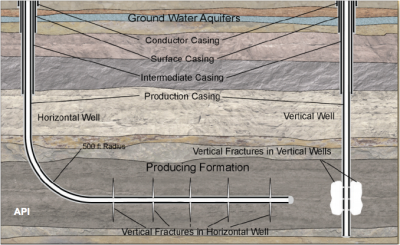 Diagram of a horizontal well illustrating the depth of well versus the depth of the aquifer. 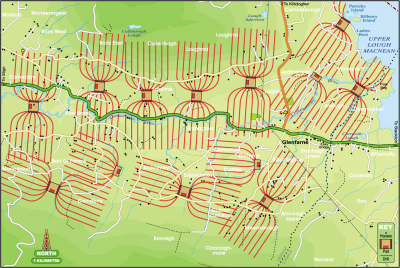 Contemporary operations then drill horizontally in order to cover a greater distance with less impact. Scott emphasized that, when done correctly, all wells are drilled well below any aquifer (which are located <1000 ft. underground), minimizing any risk of groundwater contamination. While fracking wells do use a substantial amount of water (infused with sand and other chemicals), modern facilities treat and re-use water onsite, further reducing waste. The politics surrounding fracking are not only charged nationally, but also on an international scale. Currently the U.S. and Russia compete for the European market hungry for Natural Gas. The increase in need for Southeast Asia, China and Africa only further increases the global competition within the energy market. Scott cited these reasons, as well as the increase in production of Natural Gas in the U.S. due to fracking, as contributing factors to the U.S. being on the verge of becoming a major exporter of gas. Scott also briefly discussed popular arguments made by opponents of fracking that focus on the local impact. Scott used the infamous scene from the movie Gas Land, in which a Colorado farmer lights his tap water on fire, to make a point about scare tactics often used when discounting fracking. Scott pointed out how two days after that photo was taken, there was no gas in the same water well, there had been reports of similar incidents occurring decades before fracking started across the country, and there has been no connection between the presence of gas in the water to the fracking operations in the area. Here is a short video that points out that the shortcomings of Gas Land’s claims. That being said, Scott was quick to emphasize that fracking operations are not always done correctly, which can lead to contamination and other problems. Similarly, the process itself requires a large number of trucks, drilling, continuous, loud, polluting work that can and often does adversely affect the area. The balancing game begins when one considers the economic benefits and the reality of national and global energy dependency versus the current and long-lasting environmental impact. Scott also discussed how many renewable energy methods, including wind farms and solar panels, are not without their problems. They too compromise land, require industrial operations to be established and have potentially long-lasting environmental impacts. One major emerging question, then, is where do our priorities lie as a nation? Are we more interested in mitigating climate change, and reducing immediate environmental impact, or is it more important that the U.S. reduce dependency on foreign energy while taking advantage of the increasing opportunity for exporting energy resources across the globe, thus boosting the U.S. economy? A complex question that, of course, is seeking a complex response. The reality is that the practice of fracking is not going away, nor is the global, let alone the national, dependency on fossil fuels, natural gas, and energy of all kinds. Rather than slinging libelous claims in the interest of politics and perpetuating scare tactics, the public has an opportunity to seek out more information than what is floating at the surface. Scott is one of many interested in discussing the complex problem and considering solutions. The following are Scott’s suggested resources for those interested in learning more. There is also more information available at Scott’s website, as well as in his book The Powers that Be: Global Energy for the Twenty-first Century and Beyond. This entry was posted on Friday, July 11th, 2014 at 8:18 pm and is filed under Ada's Events, Authors of the Month. You can follow any responses to this entry through the RSS 2.0 feed. Both comments and pings are currently closed.